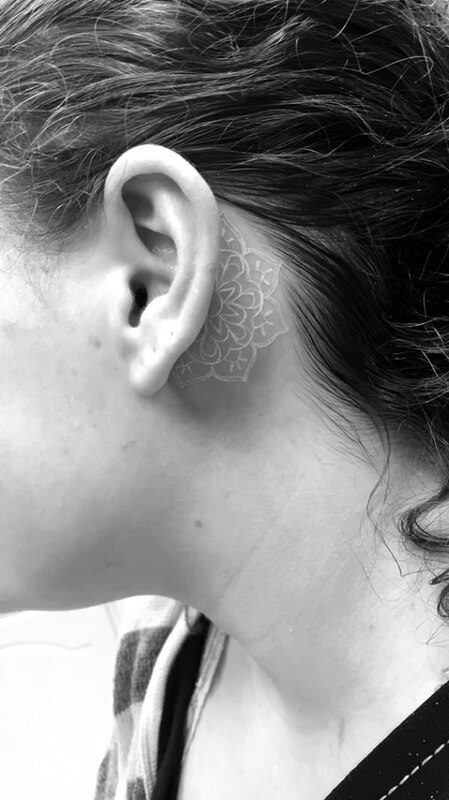 If you are looking for a fun new tattoo idea, then try out the white ink tattoos because they are absolutely extraordinary! There is just something so wonderful about them because they brighten up your skin and the design just pops, not to mention you can get any tattoo you want done in white ink. 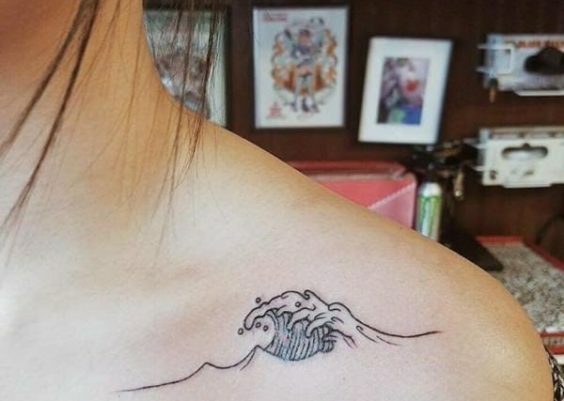 These tattoo ideas are growing in popularity because many people just love the idea of them and the unique look behind them. 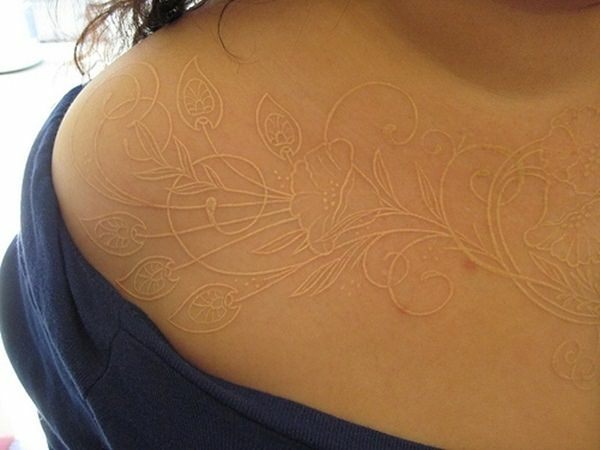 To be bold about it, white ink tattoos are completed by using thickened white ink. 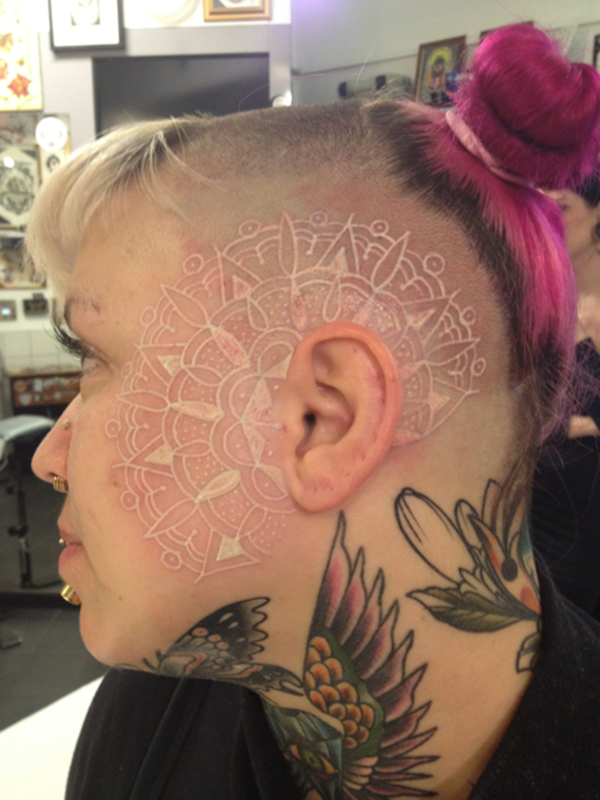 These are very different from traditional tattoos which might be just what you’re looking for. These tattoos are fun because they will also glow in the dark if you are ever around a black light. 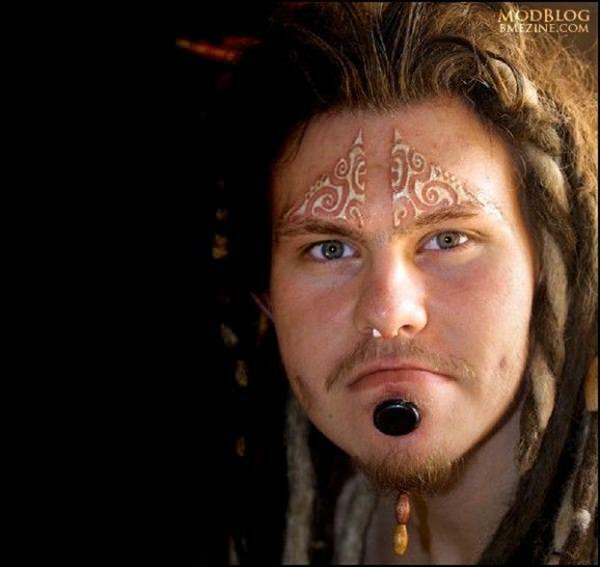 How it’s going to look will depend on your skin tone, the darker the skin, the more the white will pop, but people with pale skin will still get these tattoos because they look cool either way. 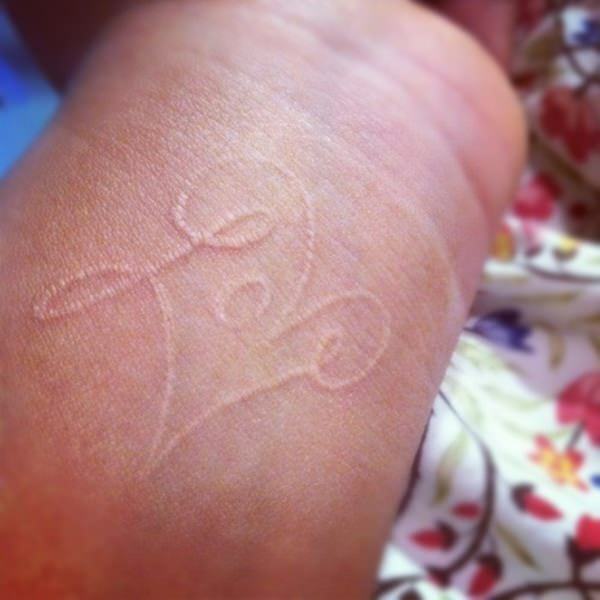 White ink tattoos can give off the look of having a scar or even having a tattoo that is embossed. Very cool indeed! 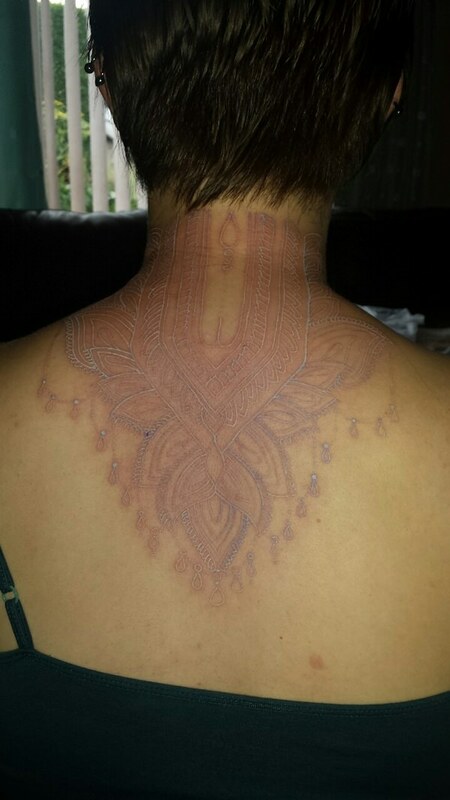 It’s is important to remember that a tattoo as unique as a white ink tattoo should be done by an experienced tattoo artist to ensure that no mistakes are made. If you want something different, you won’t find any tattoo more different than the white ink tattoo and your design options are endless. Before you decide to get a white ink tattoo, I would advise you to find an artist that is experienced with doing white ink tattoos. The last thing you want is for a mistake to be made and then you are left with a tattoo that you don’t like. 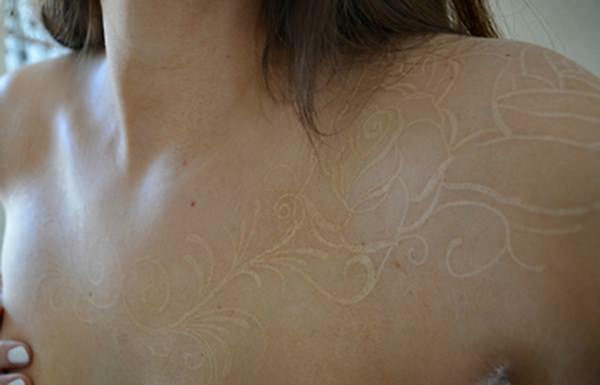 White ink is a lot thicker than traditional ink, and the tattoo requires more attention. 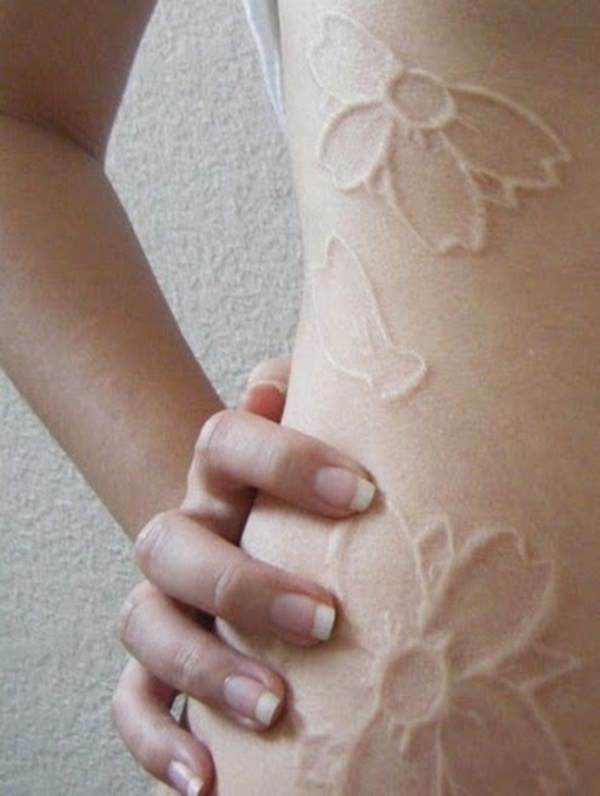 A white ink tattoo is a truly inspiring and unique idea, and it’s growing in popularity. 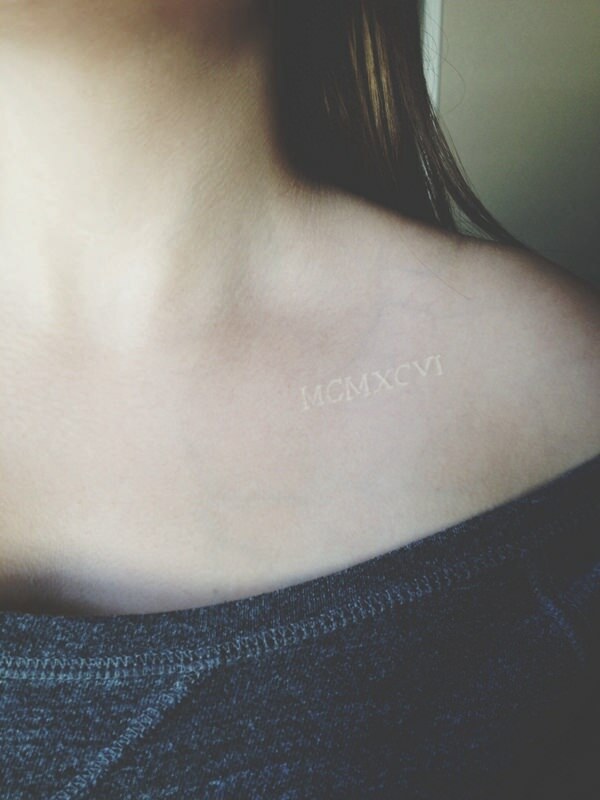 There is only white; there are no other pigments used in the white ink tattoo. 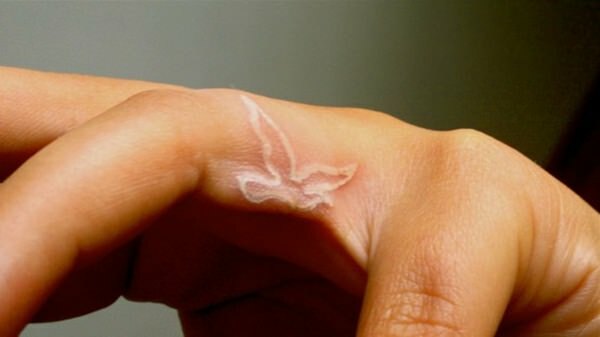 The ink is injected under the layer of skin to give it a unique look that it has. 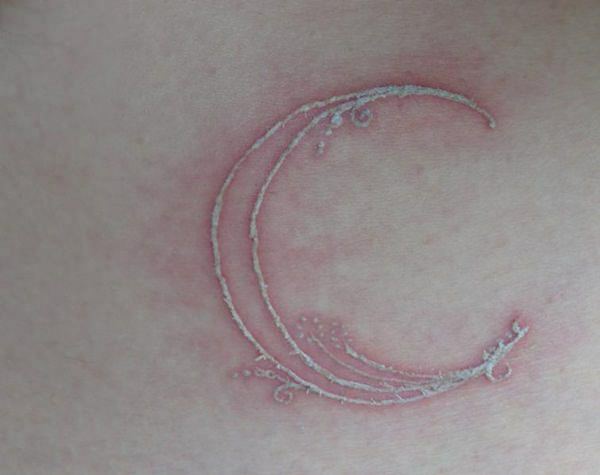 You must take great care in your white ink tattoo as it can fade easily if it’s not cared for. Make sure you use sunscreen when out in the sun or extreme fading will occur. 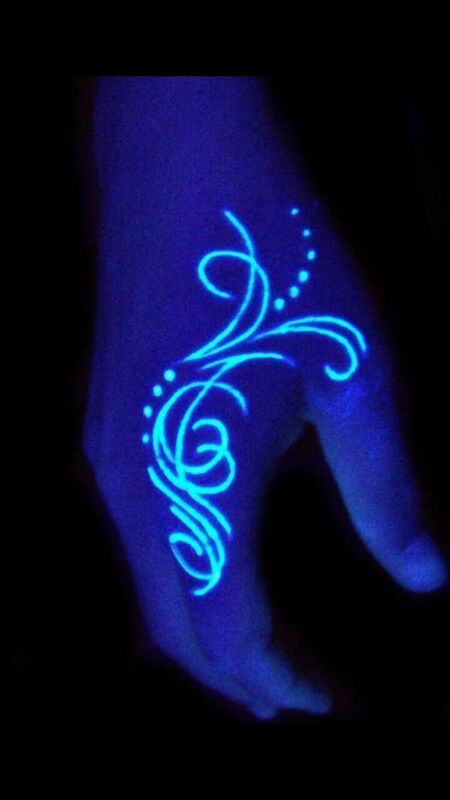 One ink that is special to this design idea is the UV tattoo. These are the ones that will show up under black light allowing you to glow in the dark. 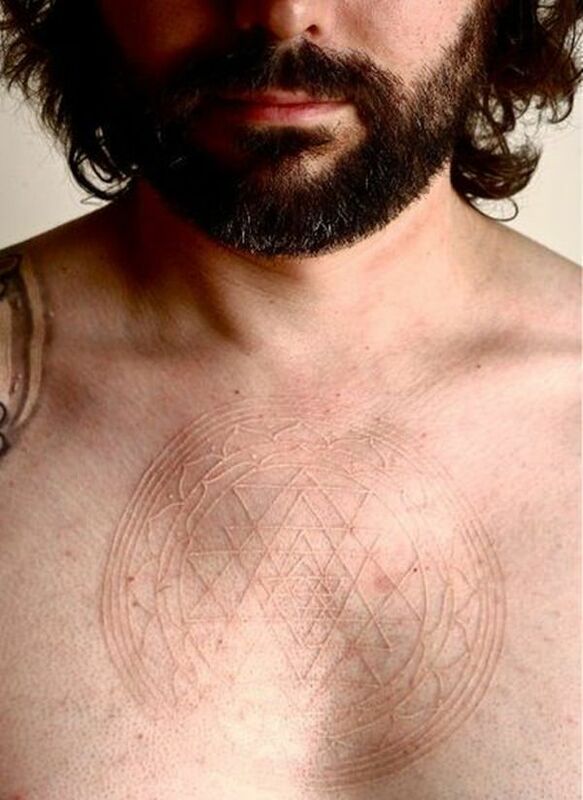 The artist usually uses stencils when creating white ink tattoos. There is a lot more effort involved as well because the artist has to go over it a few times to make sure that it is absorbed into the skin. You have to be prepared to take care of your white ink tattoo as it requires more aftercare than a traditional design. They need more time to heal, so they need to be cared for properly. When it comes to sunlight, these tattoos can fade easily so again sunscreen would be a great idea if you happen to be in the sun a lot. You should also use anesthetic gel afterward to make sure it’s healing properly and don’t use and cosmetics on the area. Always listen to what the tattoo artist tells you about aftercare because they are the experts. 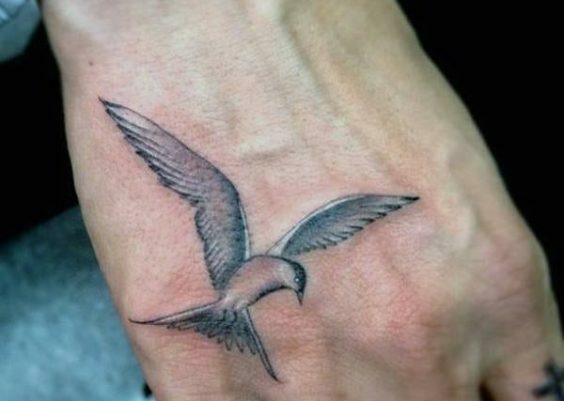 A stunning white dove that looks great on the skin. 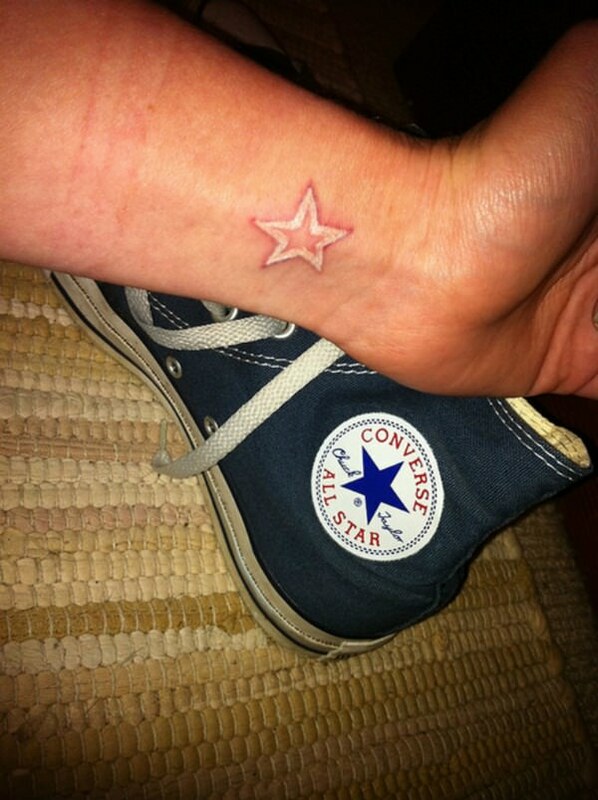 A great example of pale skin with a white skin tattoo, it still works. There is a lot of detail to this sleeve design, and the designs are just lovely. If you are looking for an elegant design, you will love this one. 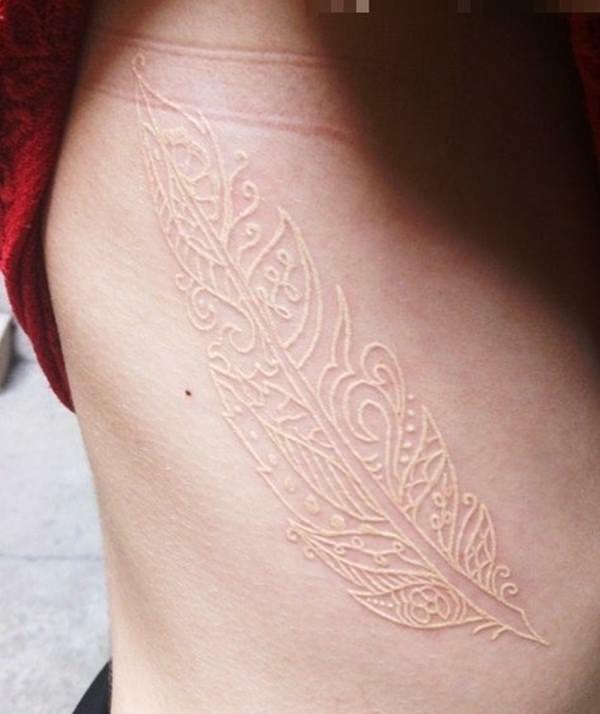 This elegant and stunning design is that of an ornate feather. 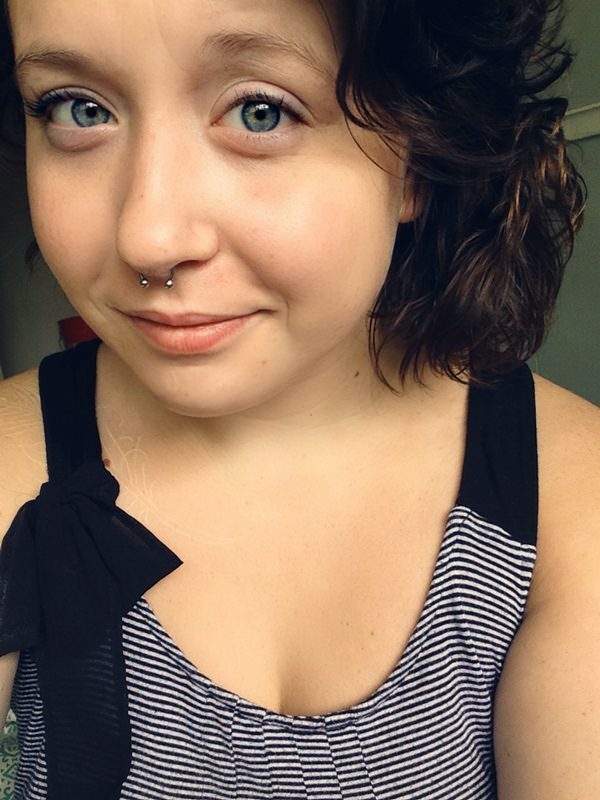 A truly beautiful look that anyone is sure to love. If you are looking to get a matching tattoo or with your spouse then this is a great design idea. 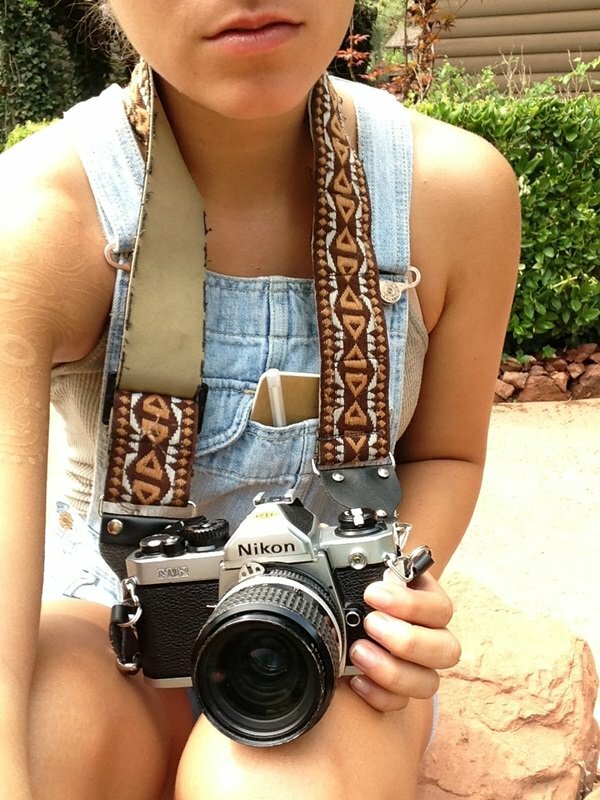 One person has the traditional ink while the other, probably the female, has the white ink. This beautiful flower is tucked behind the ear creating a very stunning look. It’s very pretty and can be hidden if you wanted it to be. 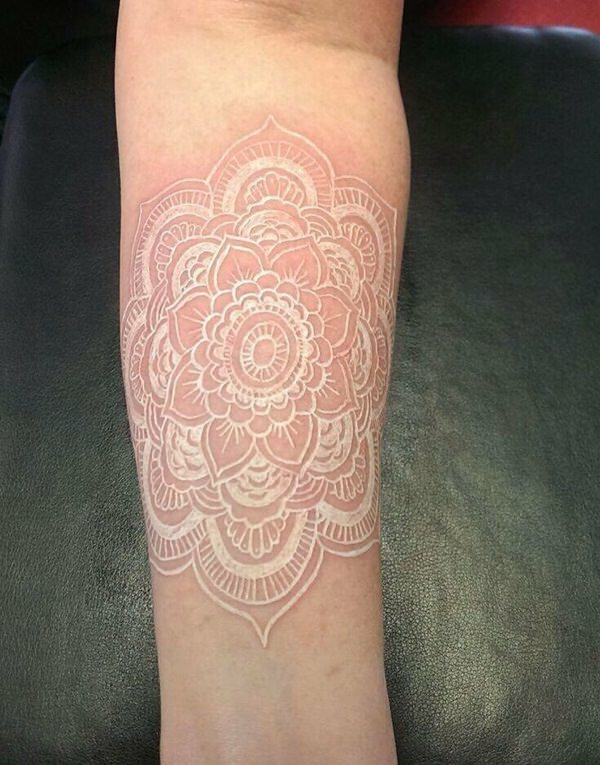 This beautiful arm tattoo is stunning because of the fact that the flower almost looks like it’s made from lace. A gorgeous overall design. If you like the shaved look, then this might be a great idea for you. 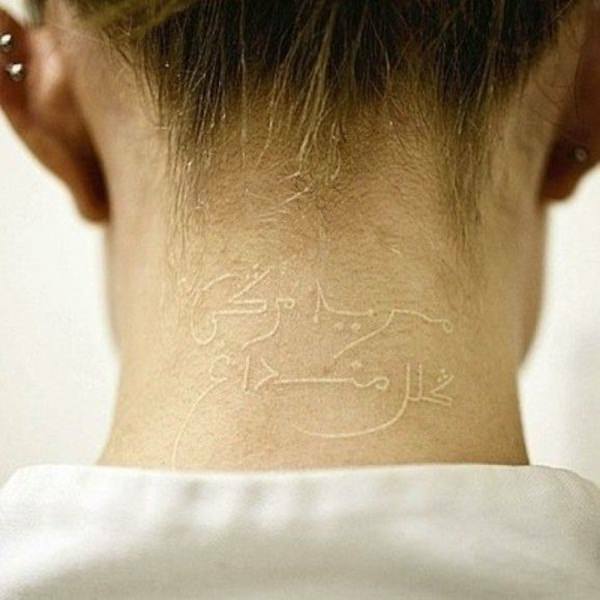 The tattoo is on the side of the head, and the white ink really pops on the skin. 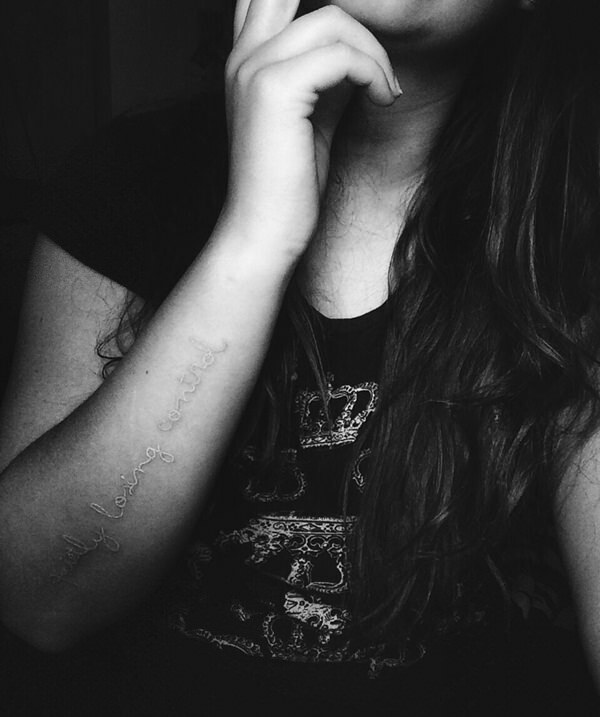 This beautiful message is tattooed on the arm, and it looks like it’s embossed. You could essentially get an inspirational message that you want. I love this unique design because the white is nice and bright and the designs are fun. You won’t find a more different design than this one. 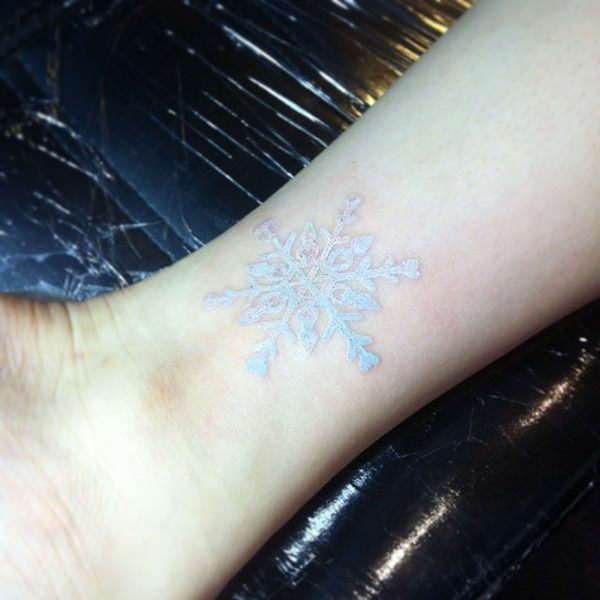 This wrist tattoo consists of one single snowflake. 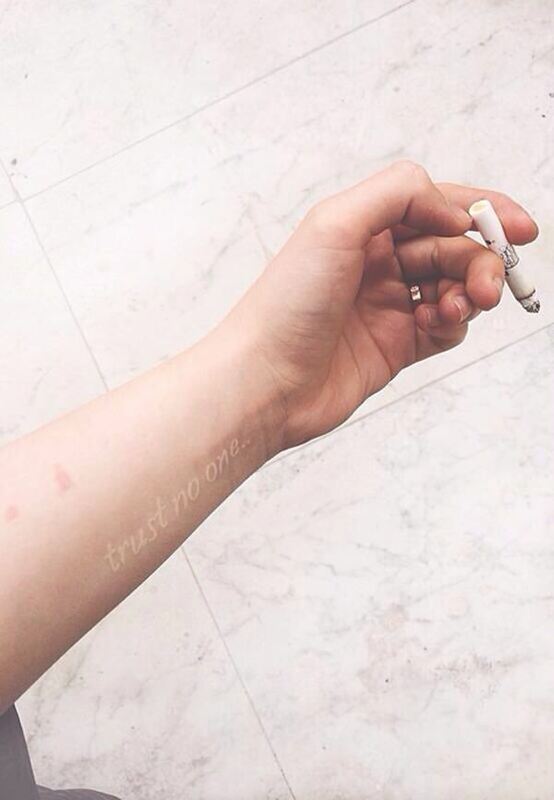 It’s the perfect design for a white ink tattoo. These forehead designs are truly unique. If you are looking for something for your face, then look no further. These designs look really cool, and they are probably personal to the owner. This design can be hidden when the hair is done. A great design that can be placed anywhere including the face. 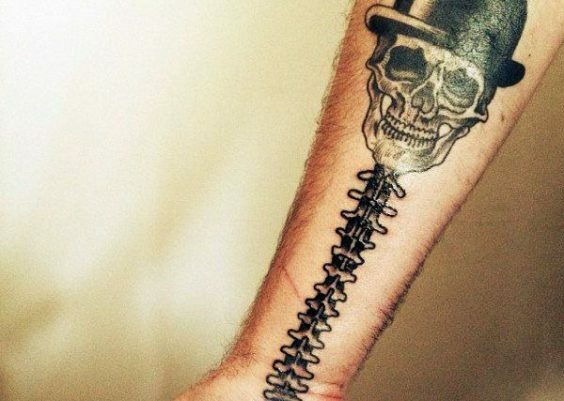 A great tattoo that looks really cool. Choose a quote that you love and get it inked with white ink. This design is very cool and it looks great with the white ink. This symbol of love is sure to make anyone happy. 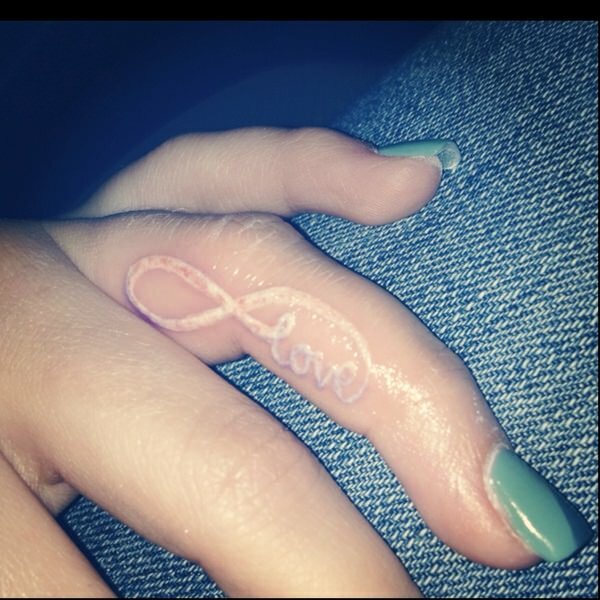 It has the eternity symbol that turns into the word love; it’s beautiful. 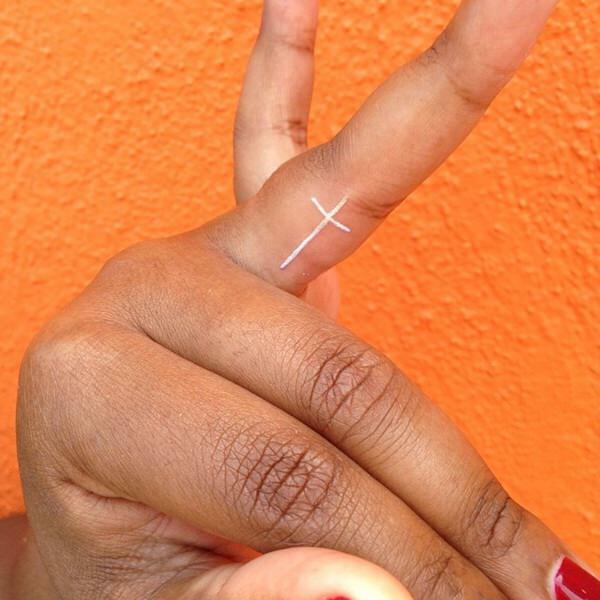 A simple cross on the finger may be just what you need to express your love for religion or spirituality. 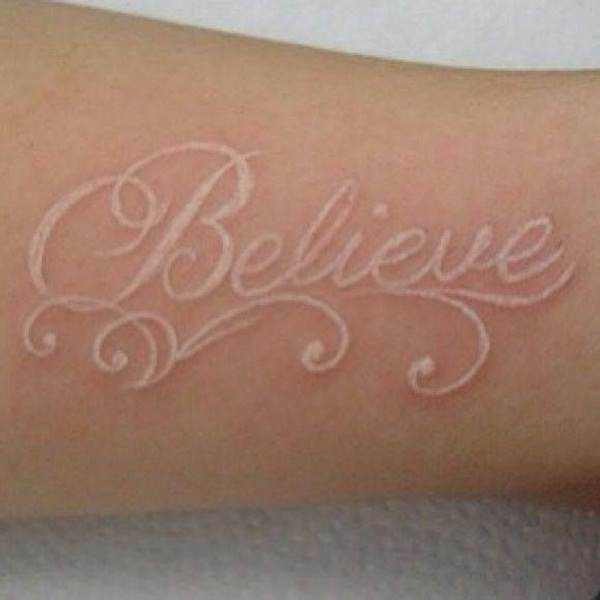 This is the perfect example of a white ink tattoo that looks embossed. This lovely flower is starting to lose its petals. The flowers go all the way down the body. If you are looking for a large tattoo design, then take a look at this stunning floral design. It’s absolutely stunning. An unusual design but one that is truly intriguing. 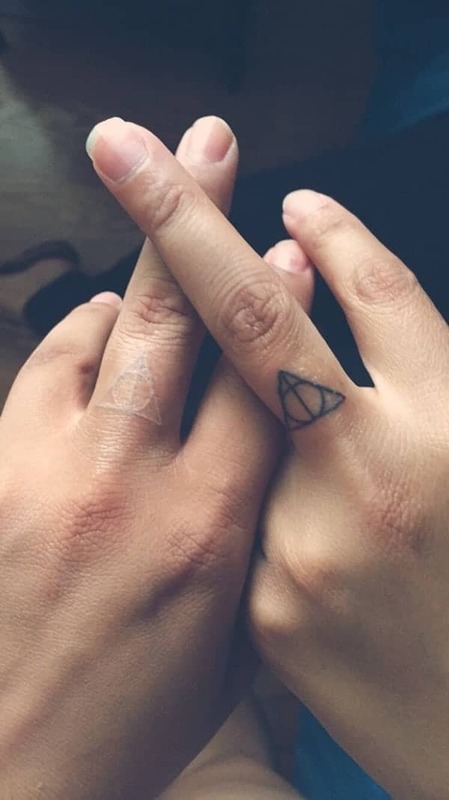 Many people get these tattoos in exchange for traditional wedding bands, but they could certainly be used for lovers and soul mates as well. 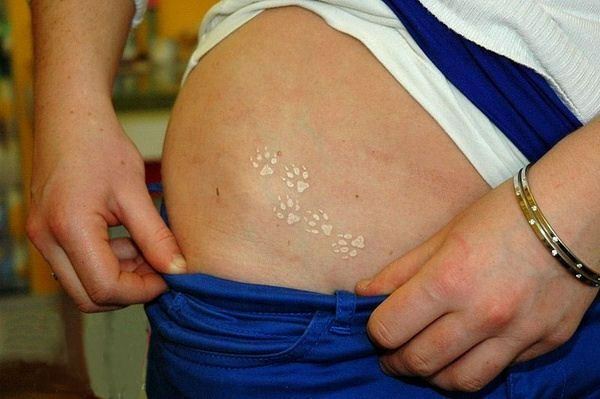 These little paw prints could be from your favorite animal. It doesn’t matter what animal, you are sure to love this design. 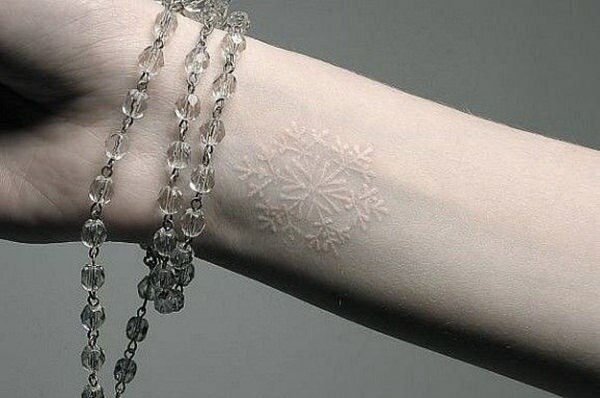 Another great example of the snowflake design that fits beautifully on the wrist. 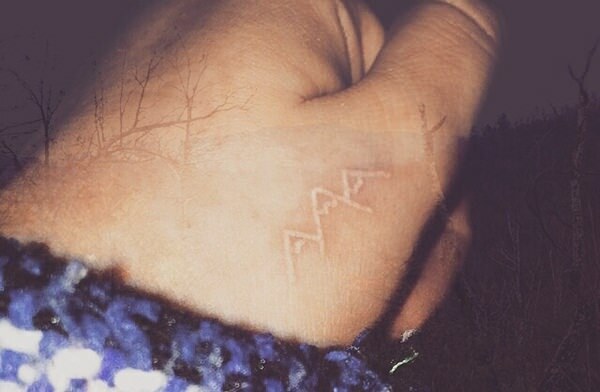 This tattoo is not only cool but very unique. The owner has his bones traced along his body in white ink. 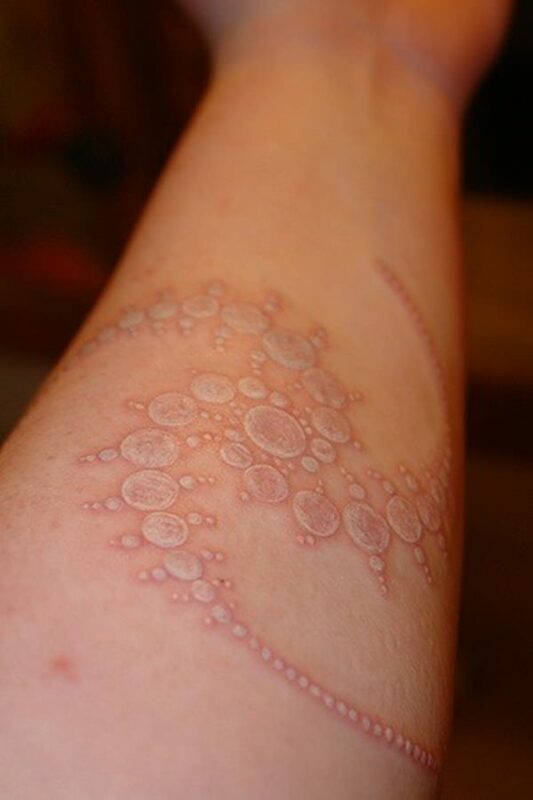 It looks amazing against the skin. 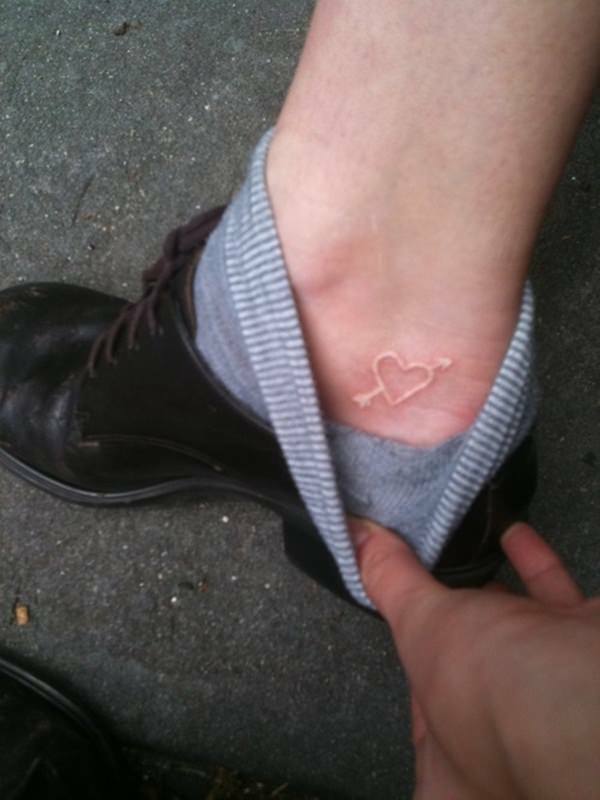 A sweet tattoo that is small enough to be placed anywhere on the body. This elegant and beautiful design is one that looks great on the finger. If you are looking for a small design, then you are sure to love this one. 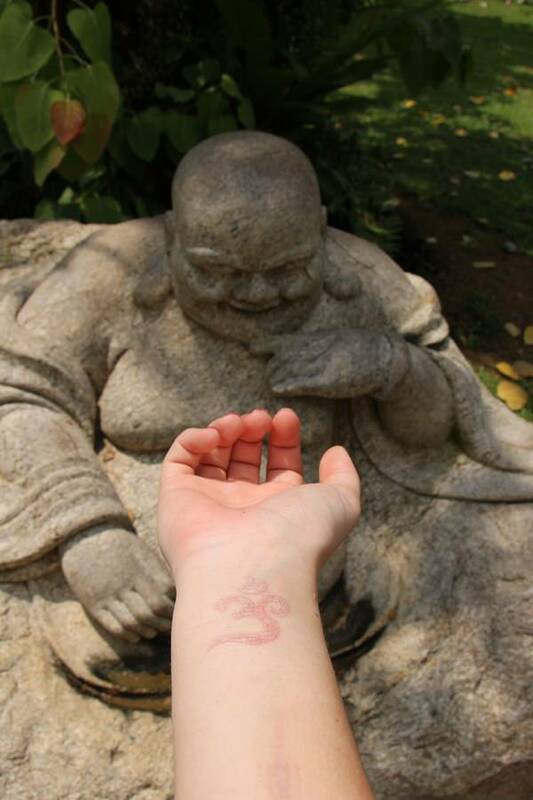 A great wrist tattoo to show off your belief system. A small and simple design that shows your passion. 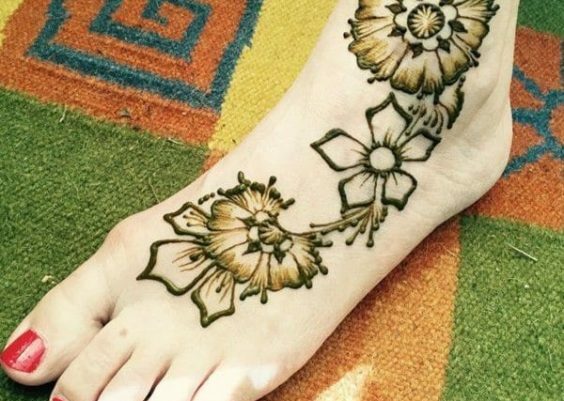 It looks sweet and elegant on the ankle, a wonderful design. I love this unique design because it’s simple yet it looks totally cool. An arrow can be a symbol of culture and heritage. 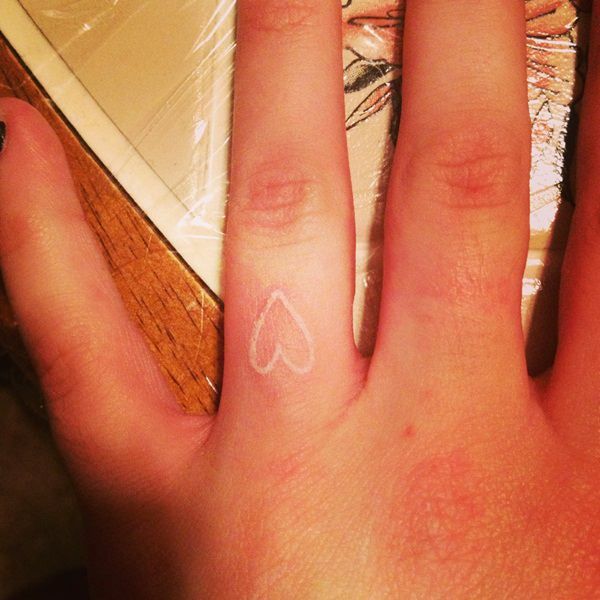 Just a simple heart on the finger but it makes for a very cute tattoo design. This design is subtle, but it covers a lot of space as well. This cool design covers the entire shoulder. This lion is a truly awesome design that you are sure to love. Another great example of a simple heart that can sit snugly on the wrist. A cute design that anyone would love. One star is all you need to follow your dreams anywhere they lead. 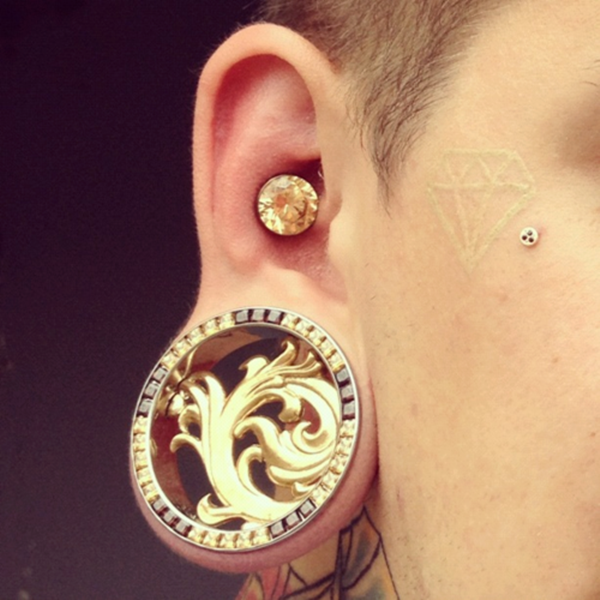 A simple diamond tattoo will make you feel like royalty. This small design can be placed anywhere, not just on the face. 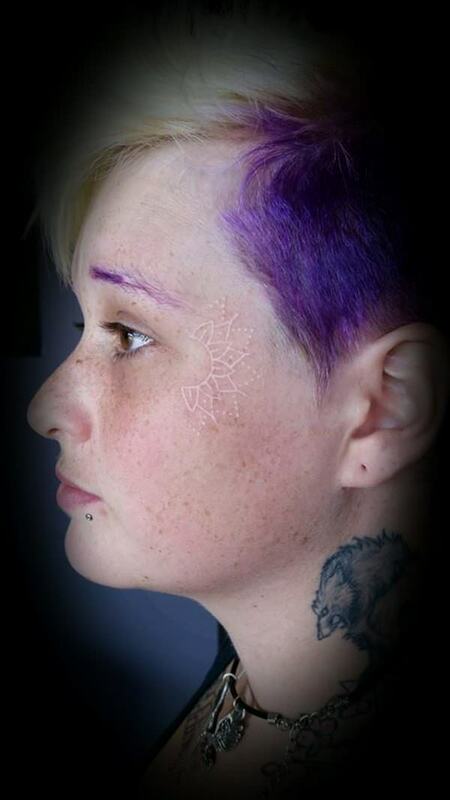 Dot tattoos are growing in popularity and you can why because they look very cool. This one spirals creating a wonderful design. 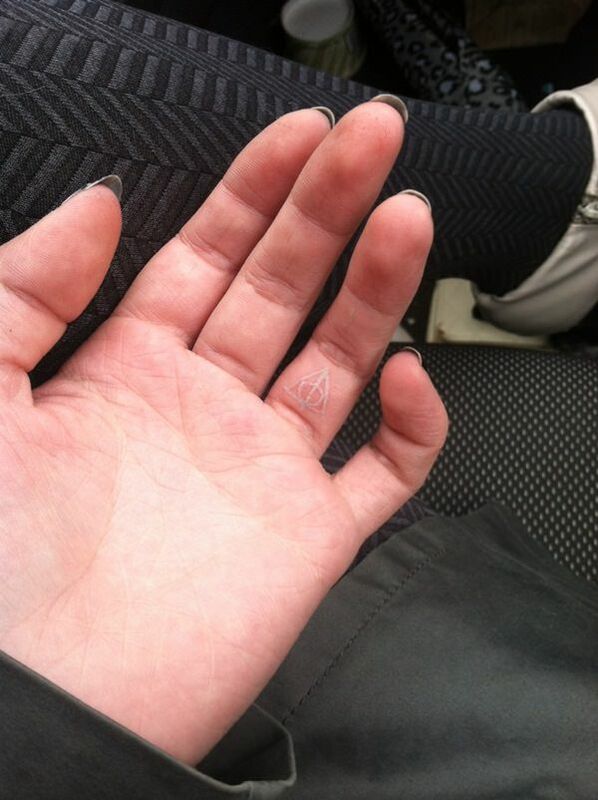 A very tiny design that fits on the finger, no one would even know you had it. 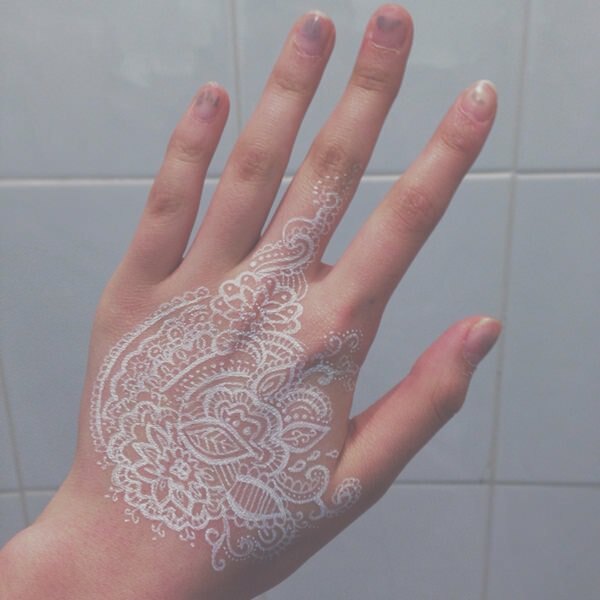 A wonderful hand design that is shocking in its brilliance, the white just pops off the skin. 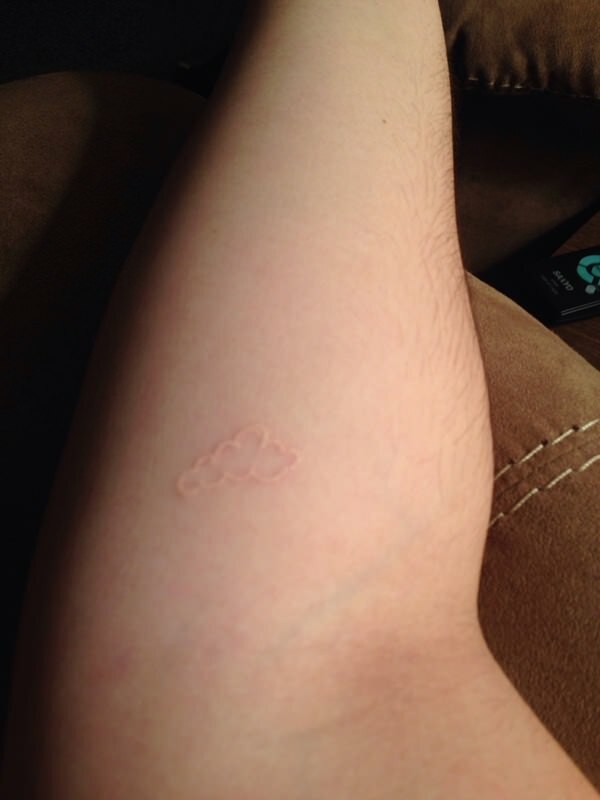 This cute little cloud design is adorable if you are looking for something sweet. 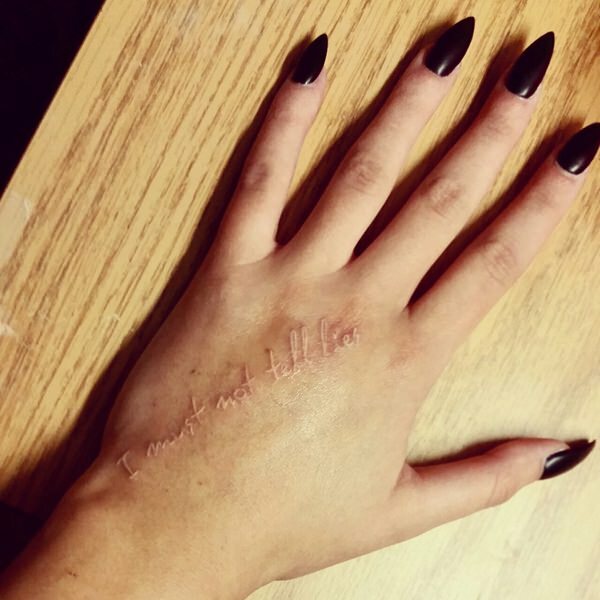 It’s small, so it can be placed anywhere on the body. This tattoo is not only amusing but helpful. If you need to remind yourself of something you believe in then tattoo it on your body to create a truly original design. 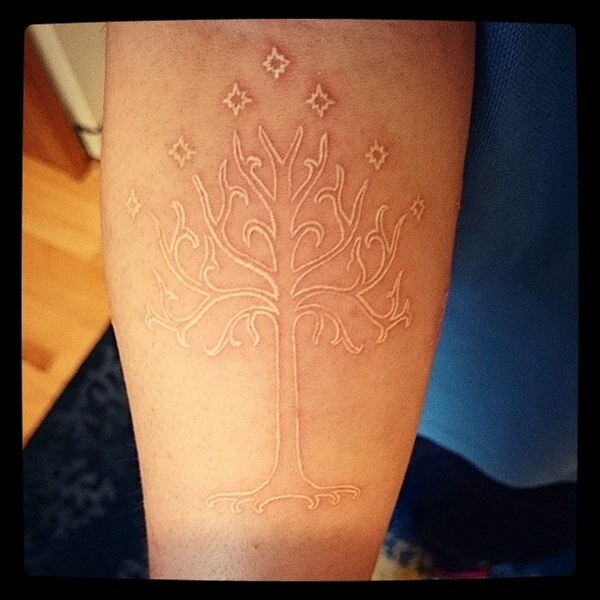 This great tree design is one that is unique and bright against the skin. If you have a love for the mountains, then you are sure to love this design. It’s small and simple, but it shows your true passion. 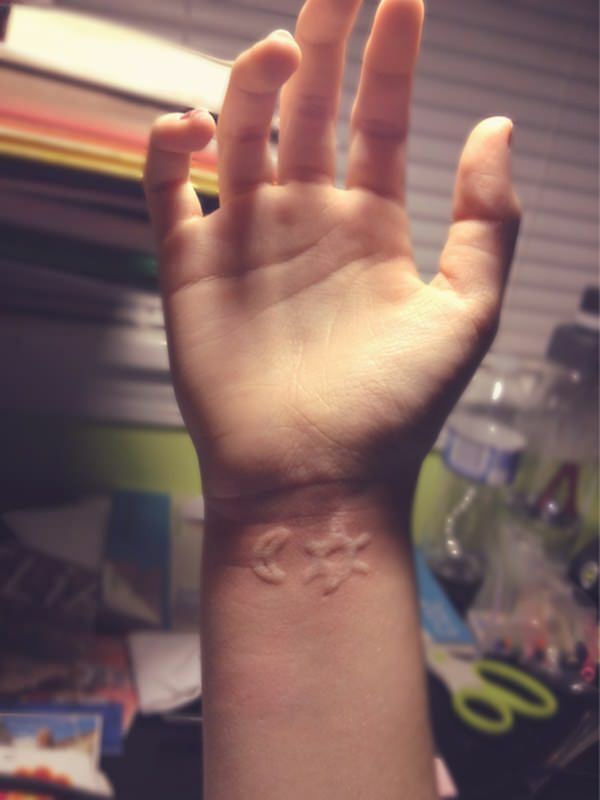 This partial flower is unique, and it can be placed anywhere on the body. This cool design is sure to make you happy because of how awesome it looks, plus it’s your own personal message. 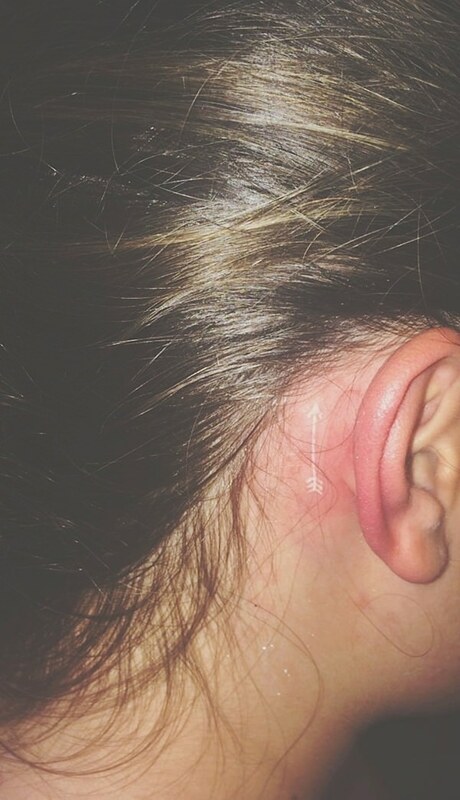 Just the tiniest of arrows can be placed on any body part that you want. If you want a simple design, then look no further. 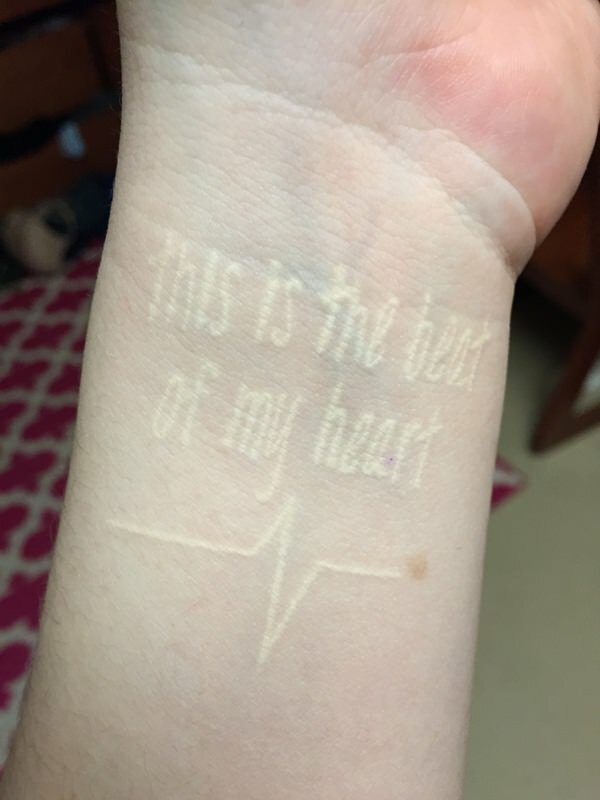 A great example of the UV designs that are available to you by using the special UV ink so that your tattoo will glow in the dark. 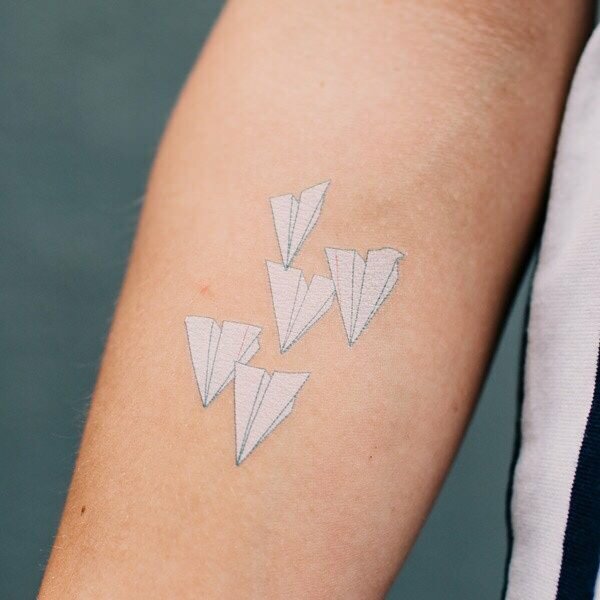 A great design that is so subtle that it’s almost disappearing on the skin. 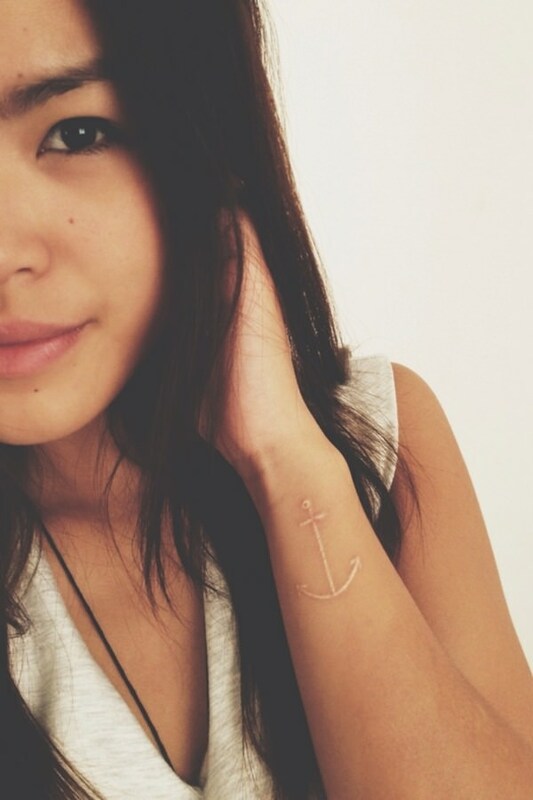 If you have a love for sailing or boating in general, then represent that love with this anchor. You can’t go wrong with this design. This beautiful floral design is truly striking. If you are looking for a large tattoo, then try this design. The seahorse is a truly unique and gorgeous creature of the sea. If you want something special, then this design is perfect. 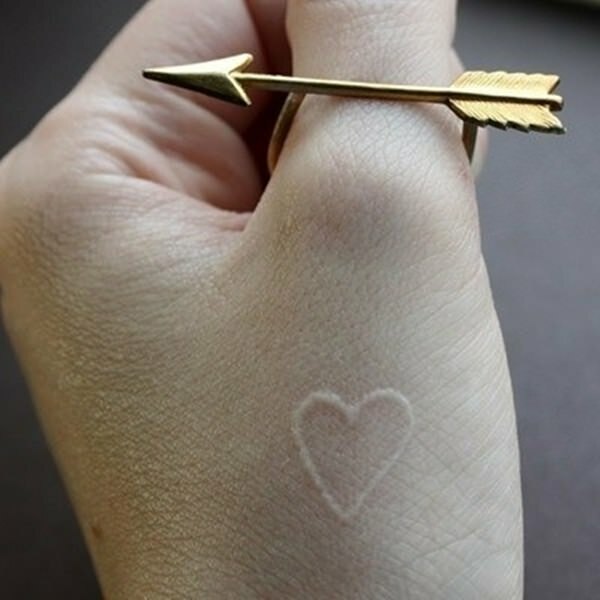 Another great example of the arrow tattoo in white ink. Show your passion with Greek letters; you won’t find a more unique tattoo idea than this one. Figure out what you want to say and say it in Greek, you will have a unique tattoo that everyone is talking about. This striking design has some insanely beautiful colors, and it’s made more special by the white ink that makes the whole design pop. 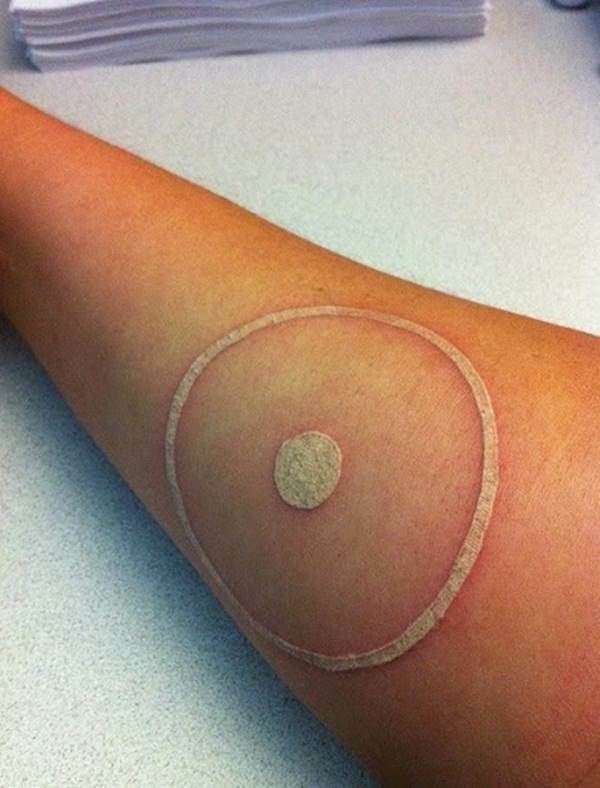 It looks like it’s standing up on the skin. 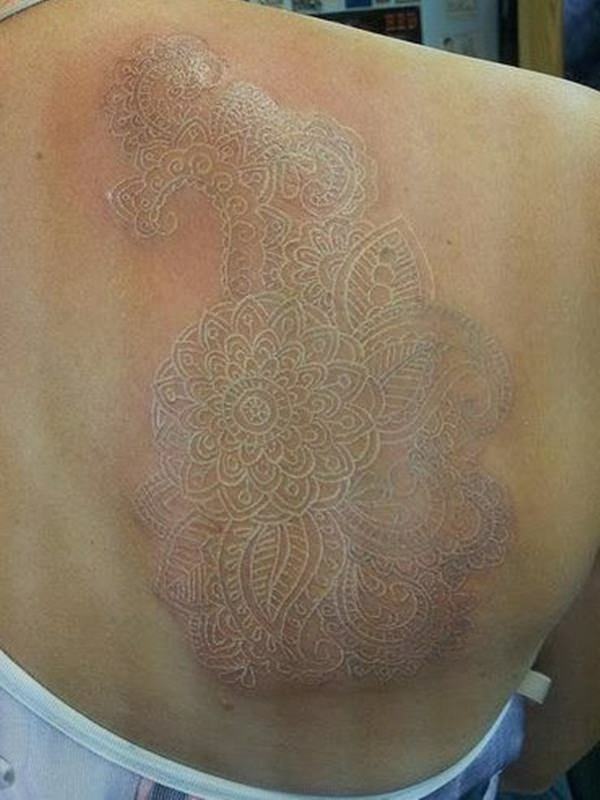 It’s a great example of how you can use color with the white ink to create a stunning design. 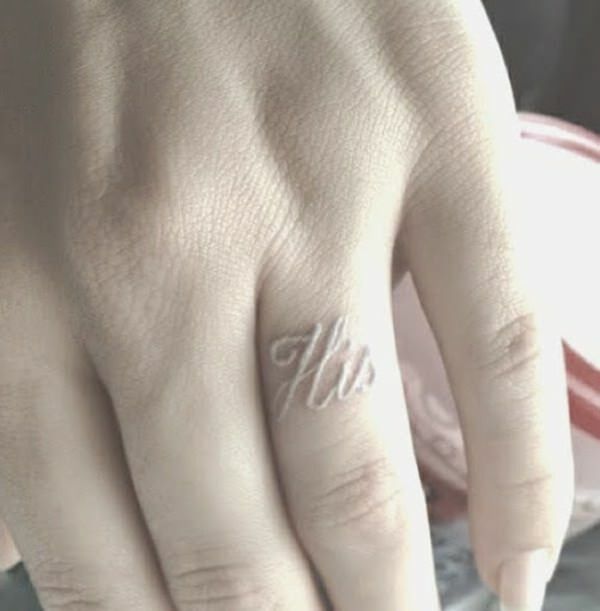 A great example of a personal message that looks amazing on the finger. Say what you want in a different language for some romanticism. It doesn’t matter what message you want to send into the world, say it with white ink. You can virtually add any quote that means something to your personal life. This great back design is a stunning combination of jewelry and floral designs. If you want a large design for your back, then look no further. 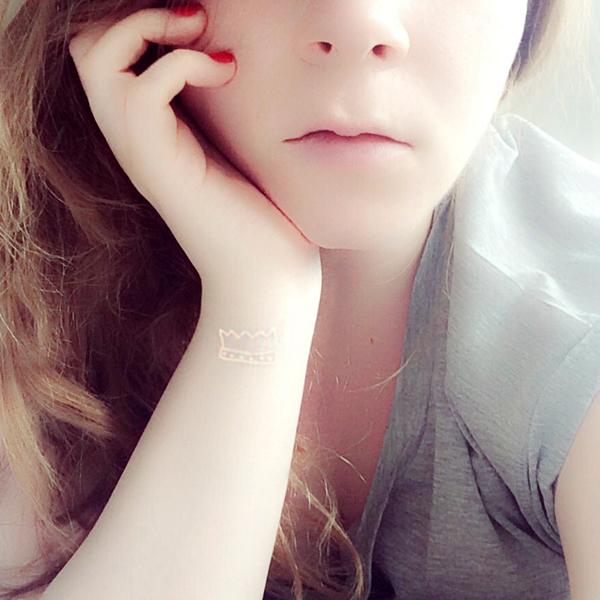 A great wrist design if you feel like you too are royalty. The crown is sweet and elegant. If you have always wanted a crown to feel like the Queen that you truly are then have one added to your skin. 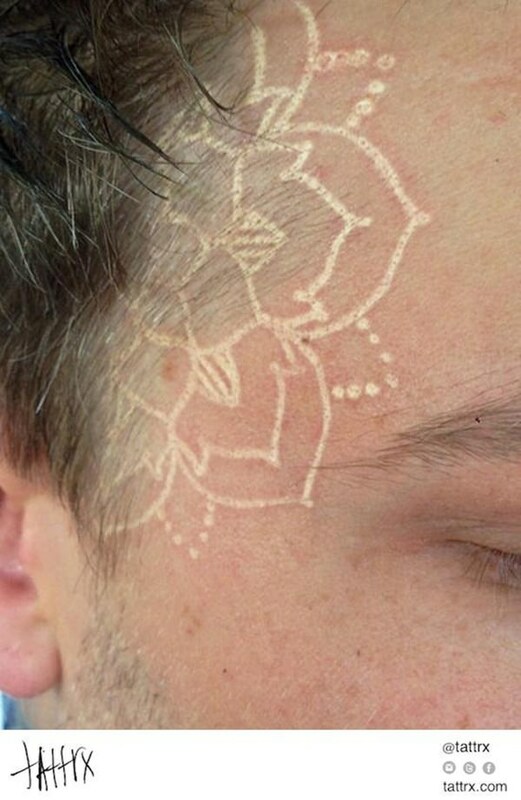 A large floral tattoo that takes up a lot of space on the face. 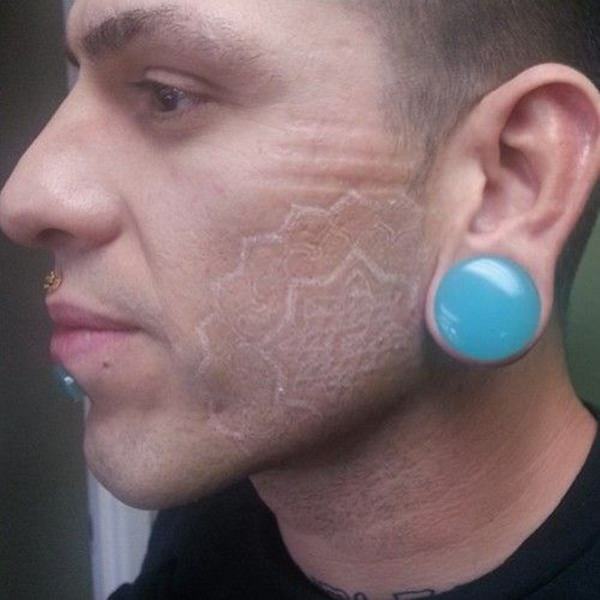 It can be placed anywhere if you don’t want a facial tattoo. These designs really stand out, so you need to consider the best place to put it. 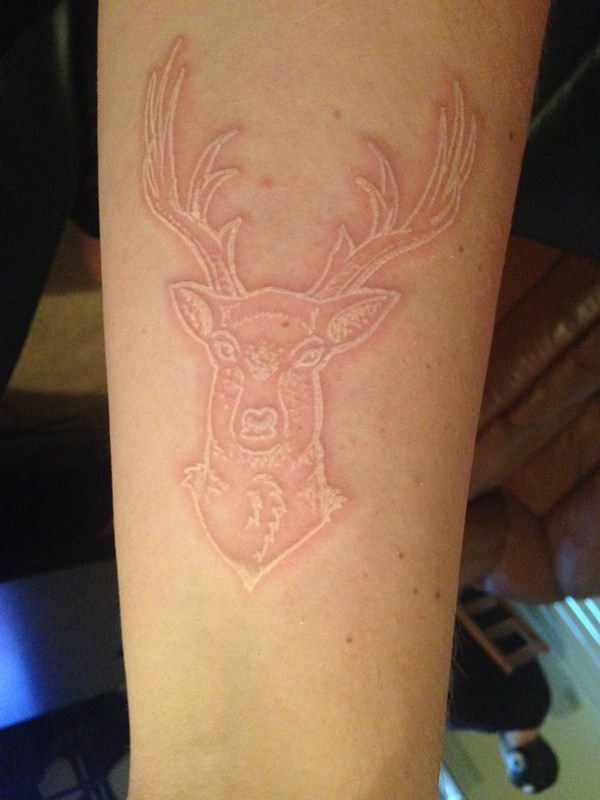 This deer tattoo is remarkable and one that any hunter would treasure. 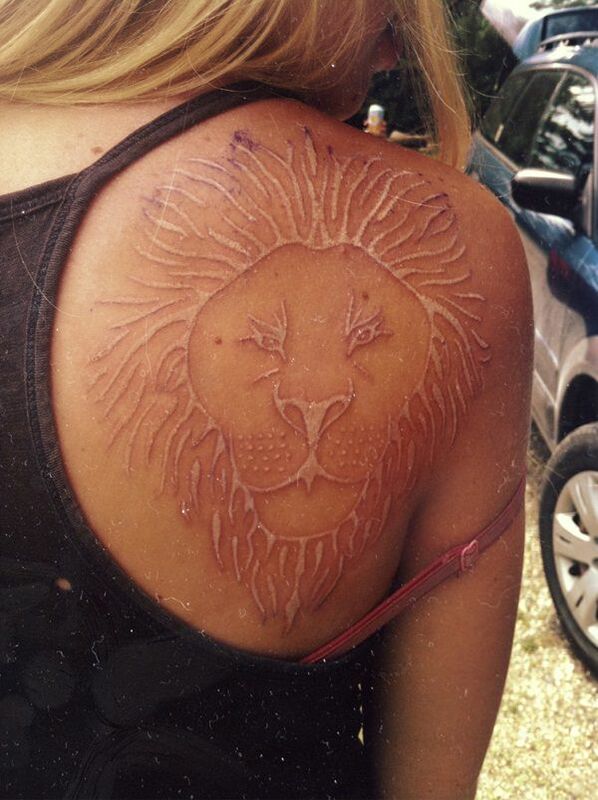 This tattoo really stands out on the skin showcasing the passion you have for the hunt. What a great design! A wonderfully unique design that is breathtaking. 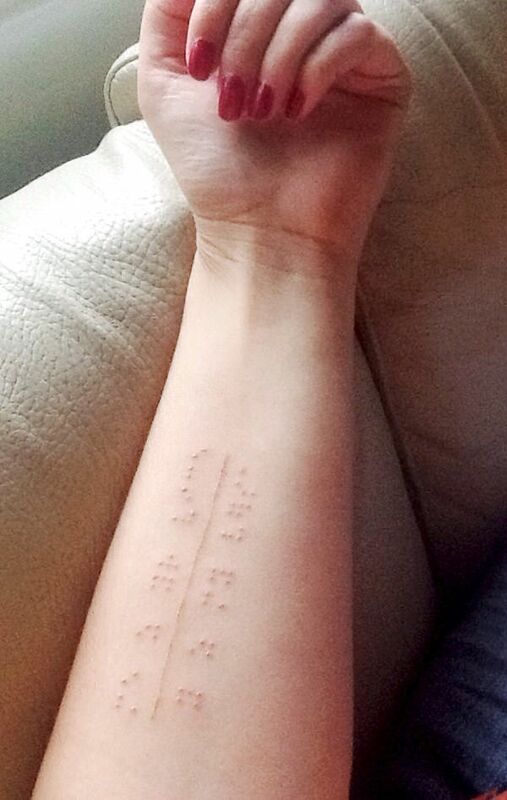 It looks like it is actually braille because of the white ink. This stunning design is made up of the moon in various stages of the eclipse. 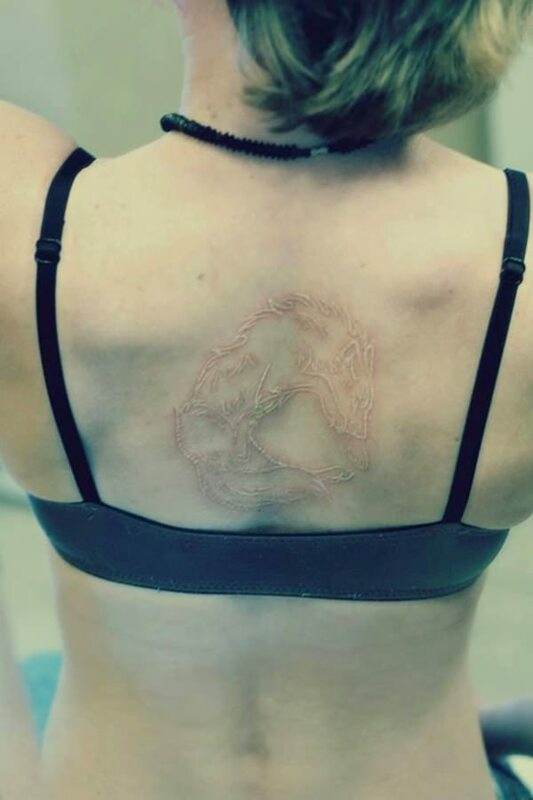 It’s unique and beautiful, and the white ink really pops on her tanned skin. 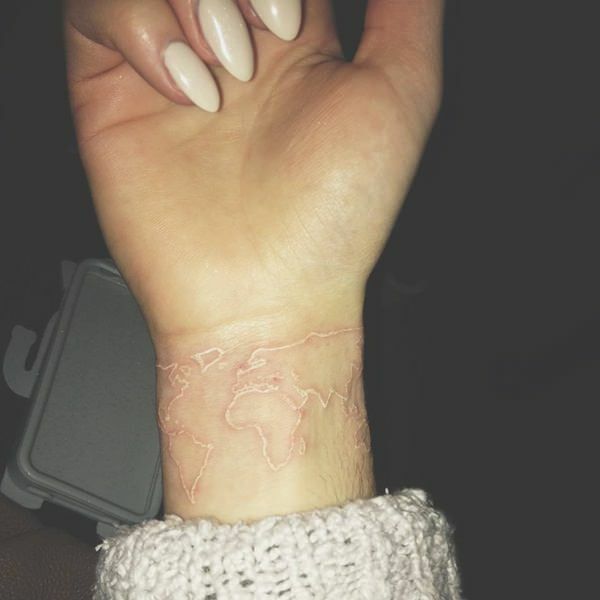 Tattoo a map of your favorite place on your wrist, it’s small and simple, yet it has so much meaning. This fierce wolf tattoo is very badass, and it fits comfortably in the center of her back. You can’t get a better tattoo than this one. 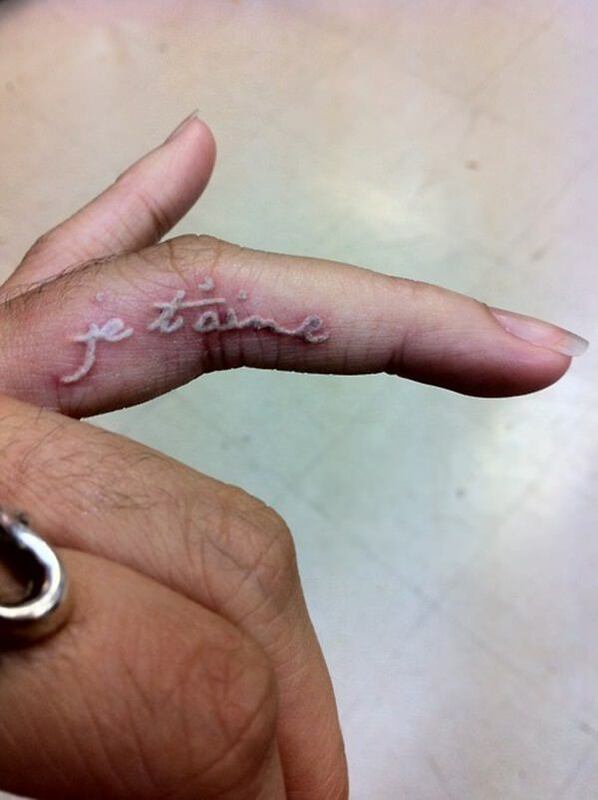 If you are a romantic at heart and you want to show the love that you have then say it with white ink. 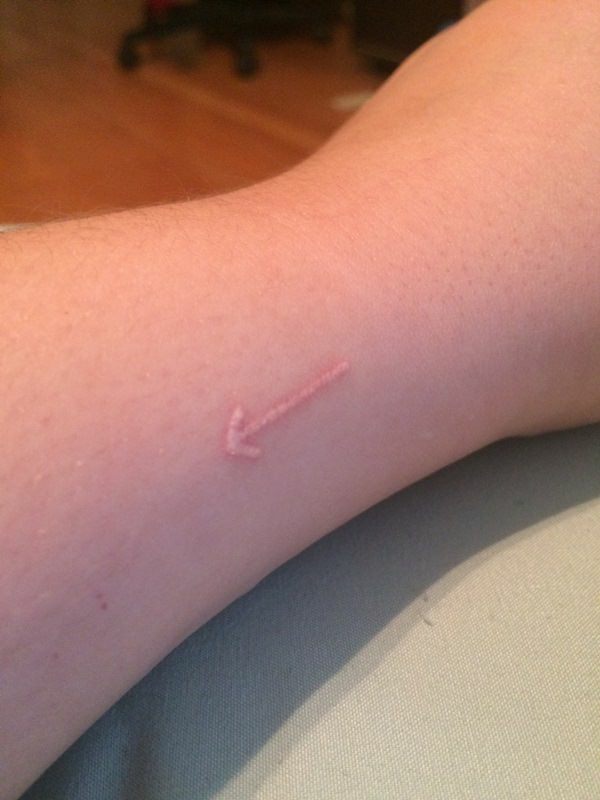 It’s a sweet tattoo that looks like a scar. Show you passion with just one word. This is a large design that crosses over the shoulder and onto the chest. It’s elegant and beautiful as the spirals shape themselves into flowers. If you want a stunning and large design, then you should look no further. 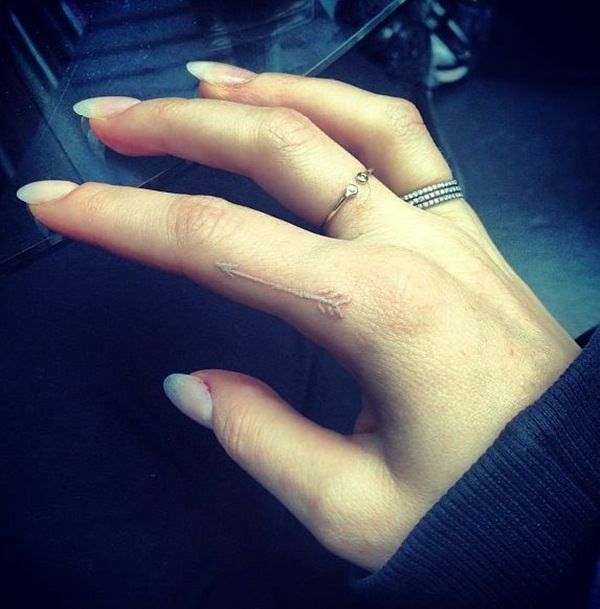 A small design that fits snugly on the finger, a simple tattoo that is almost unnoticeable. 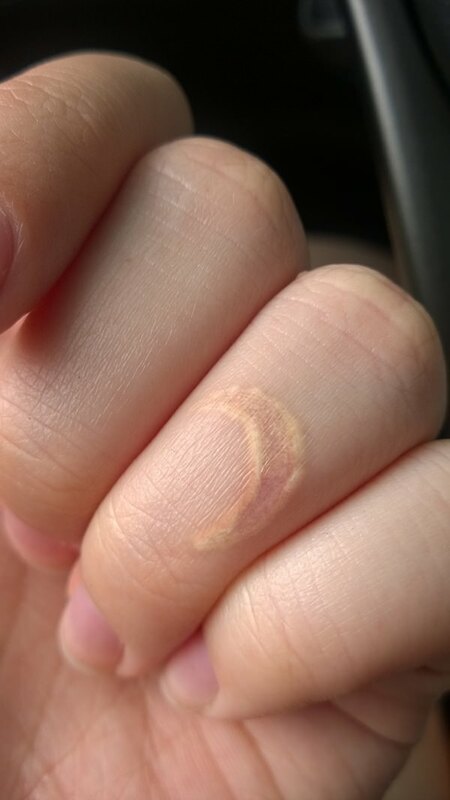 This little moon looks exactly like a scar; it’s permanent so choose wisely. 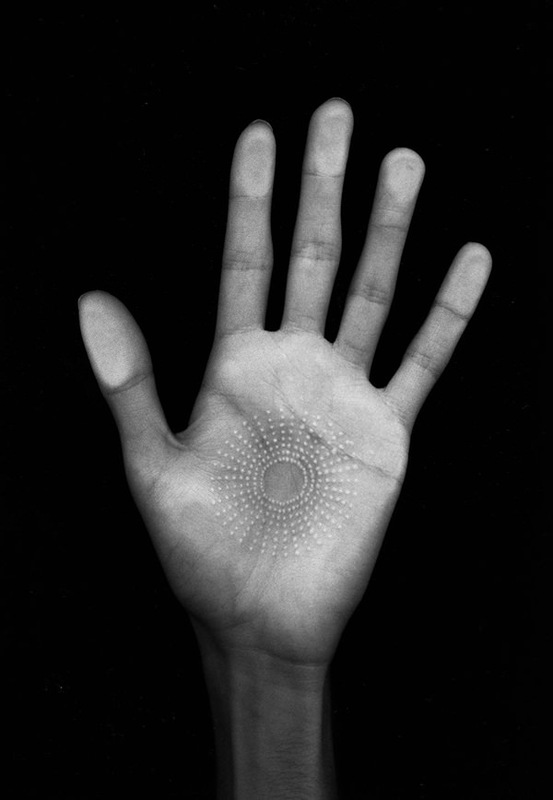 The palm of the hand id the perfect place for this sunlight tattoo design. It’s beautiful and has a lot of meaning to the owner. If you want a unique design, then this is the one for you. 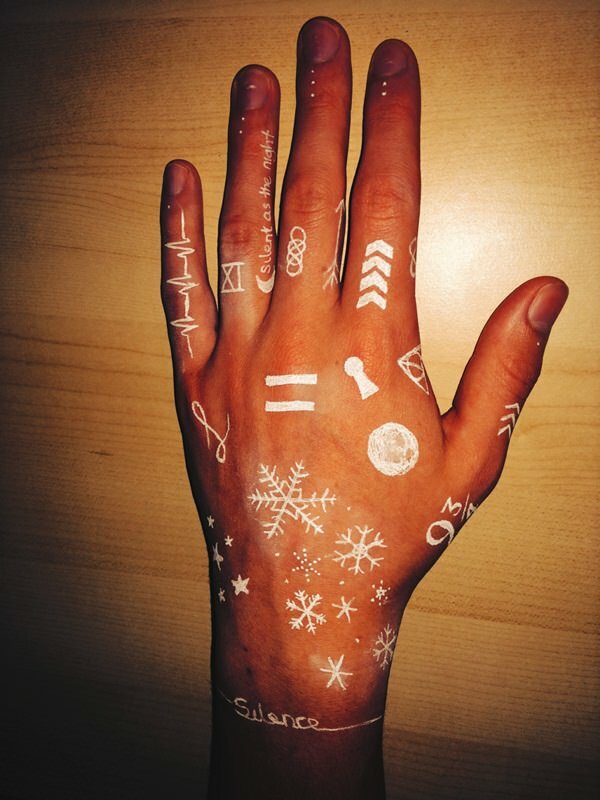 This tattoo design has many different elements that cover the entire hand. It’s hard to say what they all mean, but it’s likely that each element shows off a different passion for the owner. If you want a great tattoo idea, then try a little bit of everything. 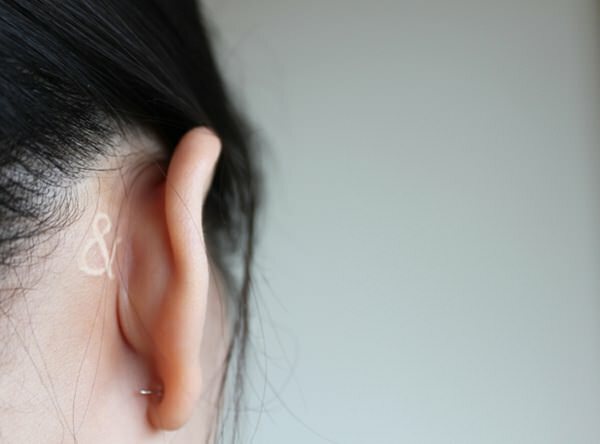 These tiny tattoo designs will fit on the wrist and can virtually be hidden; they are so tiny. Show your passion in small ways there is no need for big tattoos if it’s not what you really want. Have you always dreamed of being an angel? If so then here is your chance. These large wings are subtle, but they showcase the beauty of what it means to be one of those urethral beings. A simple symbol that has all the meaning in the world. It is small and fits behind the ear; it can stay hidden if you wanted it to.